Black hat that has a circumference of 23"
So you're an up-and-coming word artist, are you? A crafter of sick rhymes? A master of free style? That's pretty fly. We know that it takes a lot of work to get out there. You've got to come up with a cool rapper name. Gotta build a name for yourself and get some publicity. Make appearances at clubs and shows. Maybe have some free-style rap battles. Not to mention, the all-important job of networking with other artists, producers, and music makers. It's quite the up-hill climb to become a rapper. Only if you want to be taken seriously, you should probably look the part. No, not like current rappers. We're talking old school classics. Like Vanilla Ice or Run DMC. Maybe a little Fresh Prince. You're gonna need the proper threads to be taken seriously. We're talking some killer kicks. Some big shirts and coats. Maybe even some super baggy pants.But don't forget: a rapper needs his bling. 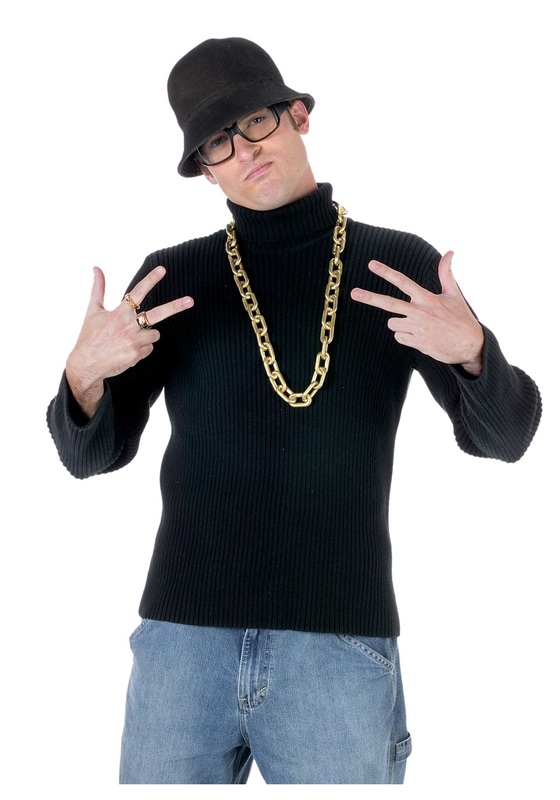 So if you're working on your up-and-coming image (along with those sick beats), try out our Old School Rapper Costume Kit. This thing comes with a black hat, black framed glasses, a gold colored ring, and gold chain necklace. Layer these shiny bits over your threads of choice and watch the whole ensemble come together. You know, like your killer rhymes.